You know the question about ‘what would be your last supper?’. I don’t like this question. I find it impossible to answer as I love all kinds of food. How can I limit it to one type of dish? However, if I could have a Top 5, then Ma’s lamb curry would definitely make the cut. I love the taste of the soft, succulent lamb with the rich, smooth and aromatic gravy. Oh and the potatoes. They are a must. They have to be soft and completely soaked in the gravy. Mmm. The recipe below has a Bengali/Kashmiri slant. Ingredients such as the cashew paste, fennel, and the garam masala composition give the curry a more delicate, aromatic flavour versus the spicy lamb curries more commonly eaten. Check out a great book which beautifully describes the history and differences of Indian regional cooking called ‘Eating India’ by Chitrita Banerji. 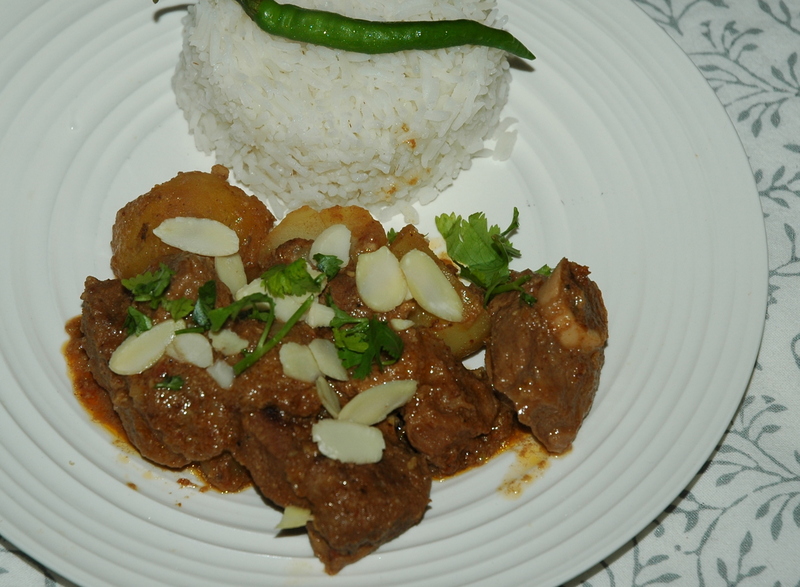 Ok back to the lamb curry. Potatoes (waxy), peeled and cut to similar size of the lamb pieces. Dima used to make small cuts in the potatoes for maximum gravy + flavour absorption! After, 5-10 minutes, reduce heat and cover with lid. NB: For a low-fat version, make the curry the day before. Leave to cool in the fridge. The next day, the fat will have solidified on the top. Just scoop out the layer of fat with a spoon and there you have it: a lower(ish) fat version of the curry to enjoy.